I was visiting our young Word Made Flesh community in the Republic of Moldova last week. 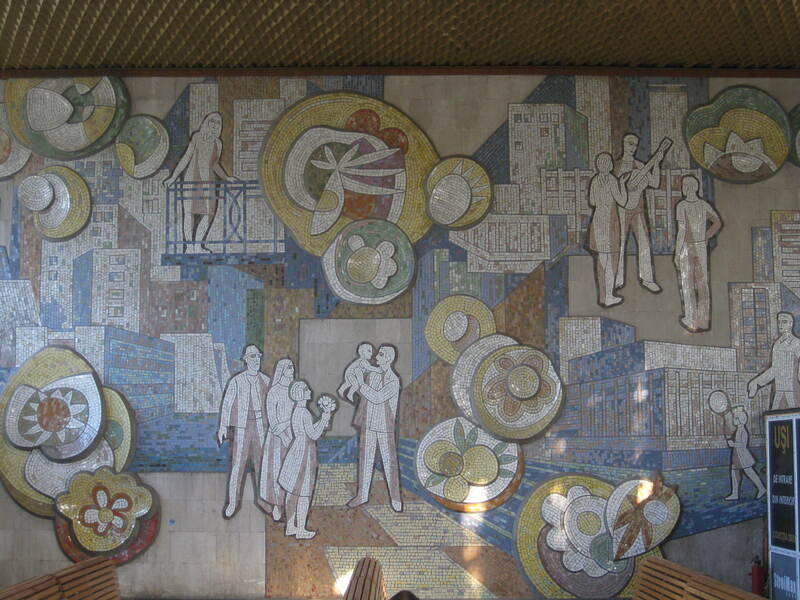 As we were getting ready to catch our bus back to Galați, I stopped for a few minutes to observe the old communist mosaic that stretched across the wall of the central bus station. Every society is supported by its myths, and every government propagates them. When I look at the communist art that is still hanging on, I can hear the stories and identify some of their beliefs. The ideology promised civilization and industry, represented by the high-rise buildings and steel construction. Against the oppression of labor in capitalist societies, communism promoted the well-being of the citizen. A woman stands above from her steely balcony rather than under its weight. A worker reads as he welds, suggesting his work serves the higher purpose of cultivating through education. There is celebration and song. And families come together and grow, achieving a happier future generation. Interestingly, there is no church, as in communism it is superfluous. Yet, the art itself is patterned after Orthodox mosaic iconography. And, like Orthodox icons, the people do not smile, although their demeanor gives an impression of happiness. Like much of communist art, the shapes are geometric and controlled. And in this depiction of utopia, there is little nature. The sun, stars and moon appear to be ordered by man to function along with the planning of the society. The flowers are not rooted. There is much industry but little life. And this and images like this are what inspired the citizens of the Soviet era. Traduc acum un documentar istoric in care se vorbeste despre abordarea comunista a vietii. Exact ca acolo ai descris si tu imaginea de mai sus. Chiar as vrea sa aflu parerea ta despre ceea ce traduc. E lucrarea unui Dr. Scheffer. vreau sa-l citesc si eu!